New book, 64 pages, FOR006. The 50 years before the American Civil War saw a boom in the construction of coastal forts in the United States of America. These stone and brick forts stretched from New England to the Florida Keys, and as far as the Mississippi River. At the start of the war some were located in the secessionist states, and many fell into Confederate hands. Although a handful of key sites stayed in Union hands throughout the war, the remainder had to be won back through bombardment or assault. 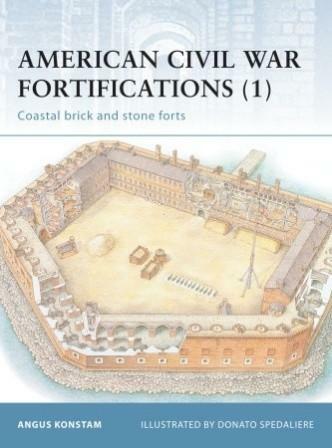 This book examines the design, construction and operational history of those fortifications, such as Fort Sumter, Fort Morgan and Fort Pulaski, which played a crucial part in the course of the Civil War. Contents: Introduction; Chronology; Design and Development; Tour of the Sites; The Principles of Defense; The Living Sites; Operational History; Aftermath; The Sites Today; Bibliography and Further Reading; Glossary; Index.